Most pool builders know the importance of a strong pool shell, but often low cost is typically more important than longevity, so some of the extra steps that can be used to increase pool shell strength are ignored. When gunite is shot, only about 65% of the actual cement is activated. The other 35% is wasted and never hardens. 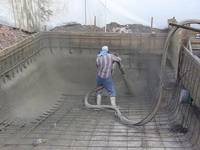 There are procedures that can be used to ensure that 95% of the cement activates, so you should always ensure that your pool builder is using these techniques.